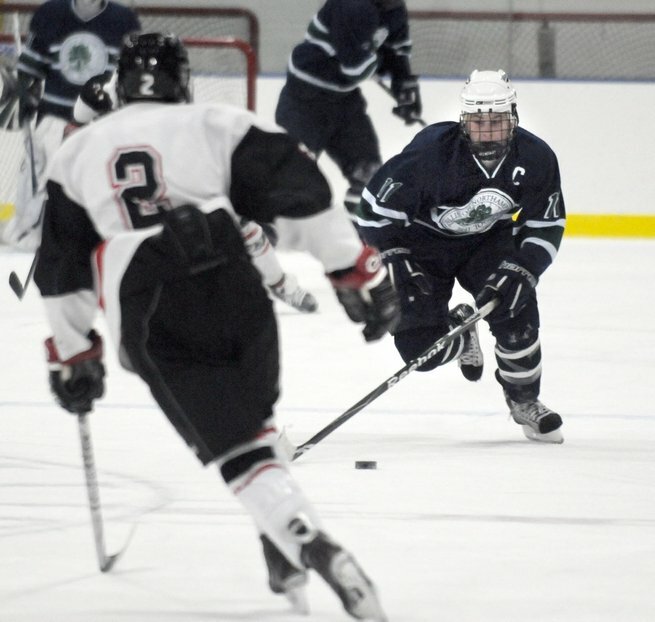 Just four years removed from his final Williston hockey game, 2009-10 team captain Kevin Kelly will be joining the Boys Hockey coaching staff for the 2014-15 season. Kelly graduated from Connecticut College, where he played hockey, last spring. Over the summer, The Hershey Company assigned Kelly to be a Retail Sales Representative in Norwich, CT. Since then, Kelly has been talking to Head Coach Derek Cunha and Williston Athletic Director Mark Conroy about the possibility of joining the team. As a senior, Kelly recorded 28 points in 27 games. He was also the 2010 recipient of the George Denman Award given annually to an outstanding male athlete who demonstrates leadership and sportsmanship. He returns to the team in part-time, but “formal position,” as Cunha described it. Kelly joins Kyle Hanford ’97 as the team’s second assistant coach. Cunha said that Kelly will mainly work with the team’s forwards while Hanford will stick with the defenseman. Kelly will also help run the team’s film sessions. Although it is about an hour and a half commute from Norwich to Easthampton, Kelly said that his hours with Hershey are very flexible, so he will fit the team’s practices and games into his schedule. Cunha says that he has had an ongoing joke with Kelly that one day his former player will take his coaching job. “Now he’s just one step closer,” Cunha said with a chuckle.